Architect George Bradley and his husband, Eddie Baba, renovated a 1941 house in San Francisco. 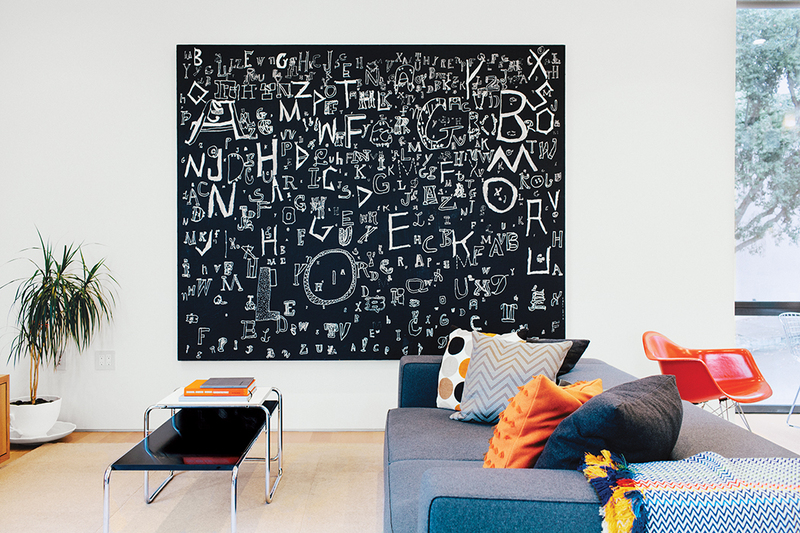 A painting by Richard Wright and a sofa by Paolo Piva for B&B Italia dominate the family room. Baba and Bradley descend the staircase leading to the second-floor entrance, located above an in-law rental unit. The steel buoys are World War II era. The catwalk above leads to the master bedroom. The living-dining room’s Stix chandelier is from Nido Living. “We wanted windows and natural light. It’s not quite a fishbowl—we have shades for privacy.” —Eddie Baba, resident. Heath Ceramics tile continues in the master bathroom. A shallow built-in bathroom shelf. The bed is from Room & Board. Throughout the renovation, Eddie diligently posted updates to his blog each week. Here, the crews removed part of the curb in order to demolish the house's garage, as required by city regulations. As in many renovations, decorative touches, like this Marcel Wanders chandelier, were occasionally installed before more critical elements. By the time George Bradley, an architect, and Eddie Baba, an attorney, found their house in the peaceful Corona Heights neighborhood of San Francisco, its original charm had long waned. After decades of renovations, the place had become a pink stucco box with pseudo-Brutalist gestures in the form of cantilevered bays punched randomly through the facade. It was a house only an architect could love, but it’s situated on a sloping corner lot between two parks, possessing two of the most valuable amenities in the city: views and parking. Built in 1941, the house was once a maze of dark rooms on four levels, consisting of a three-bedroom, two-bathroom main residence above, an in-law unit below, two garages, and a concrete bunker meant to serve as a bomb shelter. A nod to the home’s wartime history is found in the new cladding—old redwood planks repurposed from a giant blimp hangar at nearby Moffett Field, a decommissioned military airfield. Outside the house, a pair of blue steel buoys—used during World War II to net the San Francisco Bay and protect it against unwelcome submarines—gains new life as a distinctive garden folly. Among the main objectives were to unify the house, maximize the views, and create a destination where the couple could “finally have our friends and family come as often as possible,” Baba says. The day before they bought the house, in 2011, Baba, a fastidious record keeper and observer of details, started a blog to document the renovation. A highlight came the following year when, after exhaustive surveys, Bradley’s renderings, site plan, and variance made it through the planning department on the first try. The house was reconfigured to accommodate the entrance on the second floor; it stands where the original kitchen was. The couple retained the in-law unit as a rental but shrunk it from two floors to one, creating space in which to carve out an office and a guest bedroom on the bottom floor of the main house. They excavated the ground beneath the apartment and repoured a portion of the foundation to expand the footprint, adding new piers to bear the extra weight. One of the three garages (the former bunker beneath the in-law unit was converted into one in the 1970s) was sacrficed to create a second guest bedroom. The house gained a mere six inches in height and now rises just above the tree canopy, allowing it to blend into its setting despite having increased from its original 2,800 square feet to 3,800. The redwood cladding continues inside, becoming a wall of the entrance hall, a double-height space brightened by floor-to-ceiling glass and European white-oak flooring. Above, a Zeppelin chandelier by Marcel Wanders—its name is a coincidental nod to the origin of the redwood—helps temper the tall space. The new entrance opens into the public areas—the living-dining room on one side, and the family room and kitchen on the other. A central stair leads down to a home office, a den-library, and guest rooms, and up to the master bedroom, reached via a catwalk that also leads to the roof deck, with views to the water, the East Bay, and Mount Tiburon. The rooms are filled with artworks by friends and acquaintances and, says Bradley with a laugh, “a collection of uncomfortable chairs.” The star among them is in the living area: a 1966 Safari chair by Danish designer Jens Quistgaard that the couple found at an antiques shop in the city.